This day belongs to Betsey M..
"Great schoolgirl look. The splash of color makes the dress pop." 3 Days to the New Year. Three days left to take advantage of eBay's offer to double your donation amount. Have you donated yet? what an elegant transformation! !love the whole outfit..The 2nd picture is the best for me..All the Best for the couple of days left in Dec.
this combination is very stylish and it looks warm too! This is my favorite outfit from this week (so far)....the tie and hat are fab!! scary. tagged this neat as. 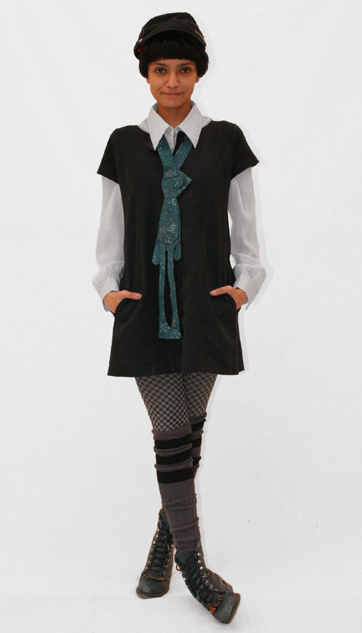 verrrry nice.. sophisticated school girl chic. @ammakke, belated response and lá 'le stiofán! those green fields are glistening white these days, you'll have to come back and visit them soon.. I'm loving it!!!!! Very quaint...very Bemelman's Madeline! why do you never smile showing your teeth? you are so pretty and a smile would make you even prettier! This is a great, wearable look, without skimping on whimsy. I've just sent another donation. Note to all those who visit this site but haven't donated anything, now's the time. It doesn't need to be a huge amount but let's try to get to the $50K before eBay's offer expires! @Scary ..We too are tired of seeing the " thick white carpets" all over the grounds here.Hope'n pray that by 2010 they soon regain their original form.BTW thanks a million for ur invitation & I am looking forward to visit those green fields again (sorry , I've forgotten whatever lil gaelic I had. ).A Blessed New yr.to U & yours!! That is totally the best tie in the world. You always look fabulous, and today is no exception! hartefactos tagged this :0) ! i would def wear this as a schoolgirl! classy and keeps you warm! Bronwyn tagged this Not Cutting It!!!! Hey Sheena! This outfit is interesting! I like the tights, knee high socks and the blouse underneath the dress. The bunny rabbit tie is just plain weird and does not go with your outfit at all. The boots are fine but I don`t like them with this outfit. The hat is very ugly, no offense. Sorry Sheena, just not one of my favourites at all. Why are these outfits so weird and ugly lately except for a few of them :( Come on ! Sorry Sheena!! Didn`t notice the side view of the hat! I actuallyu really like it!!! LOVE THE TIEEEEEEEEEEE...I WANT IT SOOO BAD!!! hey i like the tie thingy! you rock the school-girl look by the way! Absolutely adorable. Perfect match with the boots and tie. You are just too cute for words! OMG! You've got a pooka around your neck! This is too fabulous for words. Te ougat vir woorde! (That is Afrikaans, my mother tongue, for 'too cute for words'/'smarty pants'! )Fashion should not always be safe and be played by the rules; I love the fun element in today's oufit. Your colour scheme is also just perfect. But we can all see this Harvey! Channelling Jimmy Stewart, what fun. So adorable! A school girl with an adorable twist in your rabbit tie. Adorable! I love the collar and effect of the tie. Love it! very well put together! I would totally wear something like this!!! Love this, but couldn't wear the tie myself. I am so coveting those boots! Ann Marie tagged this POUKA!!! POUKA!!!! You are brilliant and clever Sheena and Eliza! I was looking for the rabbit! Zara tagged this I LIKE! Boots are gorge and the tie is so uniquely amazing u should maybe try layering with some of Hartefactos other animaltastic neck ties! Great use of the shirt and the dress!